ScaleUp Technologies GmbH & Co. KG with data centers in Berlin and Hamburg and HKN GmbH with data centers in Duesseldorf and Frankfurt will cooperate for the future in cloud hosting and colocation. Both hosting providers can look back on over 20 years of company history and have focused on open-source software and the German SME sector. Together ScaleUp and HKN have built the new IaaS cloud platform de:stack based on OpenStack. For the first time, customers can manage their virtual instances at four German data center locations. The goal of this project is to offer customers a secure, GDPR-compliant alternative to the cloud offerings of AWS, Google, and others. Unlike large international providers, de:stack will also be a partner at eye level with personal support for its customers. By offering more cost transparency, de:stack wants to differentiate itself from its competitors. Thanks to a comprehensible billing model with ready-made resource packages that can flexibly be adapted at any time, the user always knows what costs he will incur. At several individual locations, users can operate their own hardware in addition to the de:stack offering in order to set up a hybrid cloud. ScaleUp and HKN offer consulting and management services in addition to the infrastructure to ensure continuous operation. All data center locations of de:stack are located in Germany and are ISO-27001 certified. The cities of Berlin and Hamburg are already available online, and from December 2018, Duesseldorf will also be available. Another de:stack location, Frankfurt, is planned for 2019. 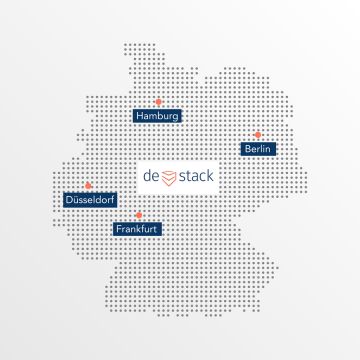 The launch of de:stack as the first multi-region cloud in Germany will take place at the OpenStack Summit from November 13th - 15th at CityCube Berlin. The de:stack team will be at the Summit with their own booth. ScaleUp Technologies CEO and de:stack co-founder Christoph Streit will also give a lecture on Edge Computing/Industry 4.0 at the Marketplace Demo Theater at 13:40 on Tuesday. Participants of the Summit are cordially invited to stop by the de:stack booth C22 to see the cloud project in action and to secure the de:stack starting credit of 150 EUR.